The ’Birds had stuff(ing) to be extra thankful for this Thanksgiving: new local high school talent and new hope in their quest for the playoffs. Last Tuesday, the first-ranked wide receiver in the province, Keelan White, officially committed to UBC. A combo player, White has posted an impressive 128 receiving yards per game with four touchdowns in as many games for the Handsworth Royals. He’s also added 166 rushing yards and a score from the ground. White has split time between Team BC and Canada’s junior national team in addition to his North Vancouver school. As his high school is only a 45-minute drive away from UBC, he should be a hometown favourite when he does grace the field for the T-Birds. “As a staff, we have agreed that Keelan White is one of the top football athletes in the province over the last few years. To get him committed to UBC is an important start to our 2019 recruiting class as it speaks to the level of athlete we are looking to bring into the program,” head coach Blake Nill said in a UBC press release. Stay tuned for our in-depth profile on White in the future. 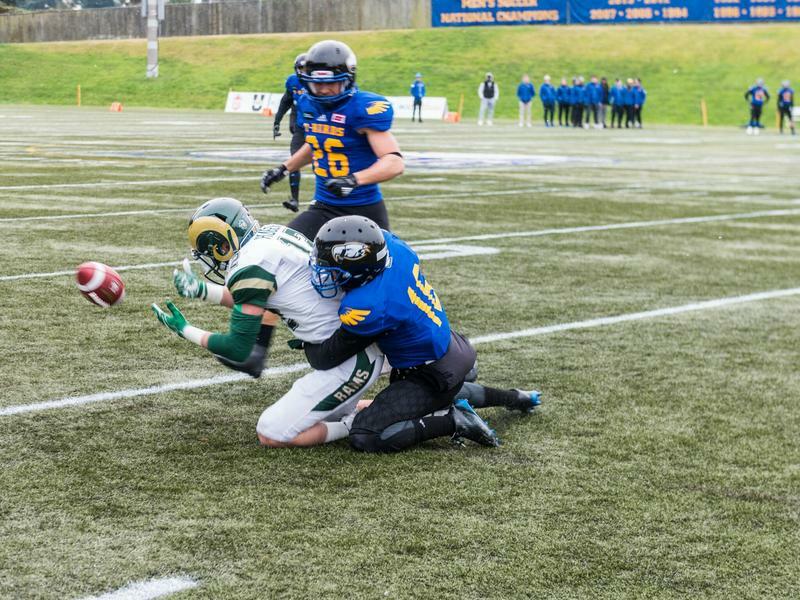 In a stunning press release on Friday, Canada West announced that the Regina Rams football program were forced to forfeit all 2018 wins to date because they fielded an ineligible player. According to Canada West, it seems that an ‘oversight’ in student-athlete intake was the cause. The Rams, who were previously 3-2, now fall to 0-5 — evidently, worst in the league. One of their forfeited wins was against UBC, who now has a 2-3 record and ties with Alberta for fourth. But when it comes to playoff positions, UBC is really fifth because of their 0-1 head-to-head record against Alberta. The top four teams in the Canada West conference qualify for the Hardy Cup Playoffs. Despite being outside the playoff bubble right now, UBC is in the thick of the race — potentially one win away from the second seed. With three games to go, UBC plays Saskatchewan (3-2) on Friday at Thunderbird Stadium at 6 p.m. in the Black Out game. We’ll see what they can do with this season-saving lifeline.